Looking for an easy, in-season recipe? 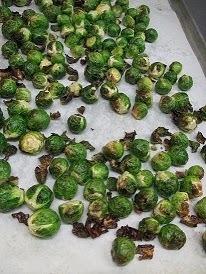 Try out the Brussels Sprouts with Pecans recipe we prepared during our last Cooking Matters Cooking Class. Cooking Class participants practicing their knife skills. Our Cooking Matters Cooking Class series is a six-week course for clients and their caregivers. Participants work alongside a professional chef and our registered dietitians to prepare a great, healthy meal all while improving their kitchen skills. Graduates of the course walk away with knife skills, an understanding of nutrition and ingredient labels, and the ability to plan meals around their personal budget. You too can get excited about vegetables by serving up this recipe which is not only delicious, but provides an excellent source of Vitamin C and a good source of fiber! Trim ends of sprouts and slice in half. Roast until cooked through, about 15 minutes. Check after 5 minutes and stir to avoid sprouts from stick to the pan. Brittany is a registered dietitian and has been with Food & Friends since October 2012. Her previous experience was working as a clinical dietitian on the pediatric hematology and oncology unit at Children’s National Medical Center. Brittany completed her dietetic internship in Baltimore, Maryland through Sodexo-Mid Atlantic and is a graduate of Bluffton University in Ohio. She enjoys traveling, playing tennis and softball, making crafts, and has a new found love for leading cooking classes. 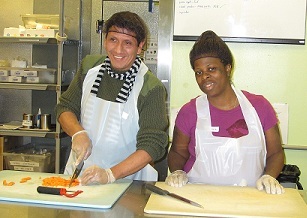 Learn more about Food & Friends' nutrition services.